What I term "The Middle Past" is the modeling era from the time I arrived in California until I was settled into my house in Wenonah, New Jersey - spanning the years from about mid-1984 until late 1996. It was during this period that most of my modeling preferences gelled. I went from freelancing the Great Northern Railway (rerouting part of it into Wyoming and ignoring the CB&Q completely) to wanting to model the Burlington lines through Wyoming in an accurate sequence and in a recognizable form. I also went quite sharply from the diesel era to the late steam era, for two reasons. First and foremost, on a small- to medium-sized layout, the generally shorter rolling stock of the steam era allows trains of a given length to have more cars in them than a comparable train of the more modern era. Second, I obtained my first brass locomotive, a Pacific Fast Mail Great Northern H-6 Pacific in glacier green livery. Up to that point my experience with steam was a few pancake-motor Bachmanns and that venerable old AHM Big Boy. The PFM steamer's operating characteristics put the rest of my feeble steam roster to shame, and opened my eyes to the fact that steam can be made to run every bit as good as the Athearn flywheel diesels I relied on as the bulk of my active fleet. More on the effects that H-6 had on my modeling later. I have very few photos of this modeling period available at this time - October 2017. After I retire and move I'll have access to a lot more, so I may scan a few and post them here. In mid-1984 I began a long-term temporary assignment in Lompoc California, working on the Space Shuttle launch site at Vandenberg Air Force Base. The company very graciously rented me a nice condo with a two car garage. Given the very temperate climate in Lompoc, the almost complete lack of annoying bugs and the fact that the place had no basement, that garage was a perfect spot to build a layout! So I began a layout that filled about 2/3 of the garage and, as fate would have it, would be almost duplicated some years later when I lived in the Puget Sound area. 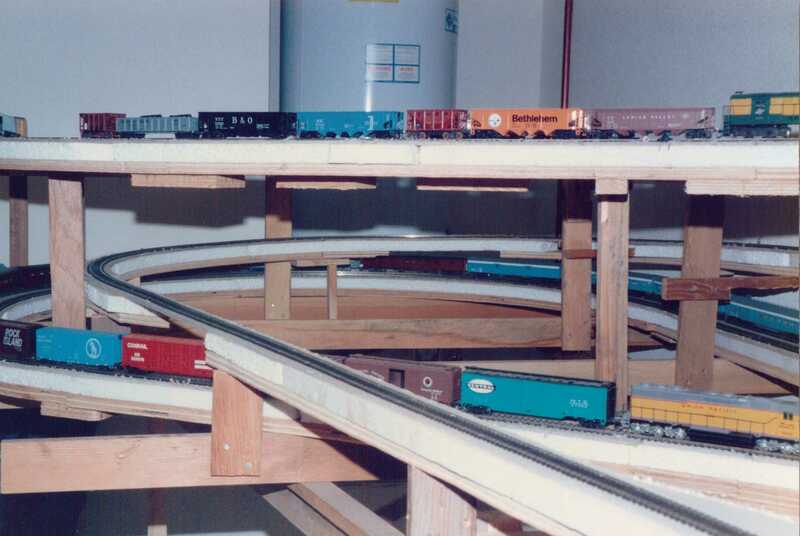 Here's a shot of that Lompoc layout about a year after I started building it. Most of the layout made it into this picture. 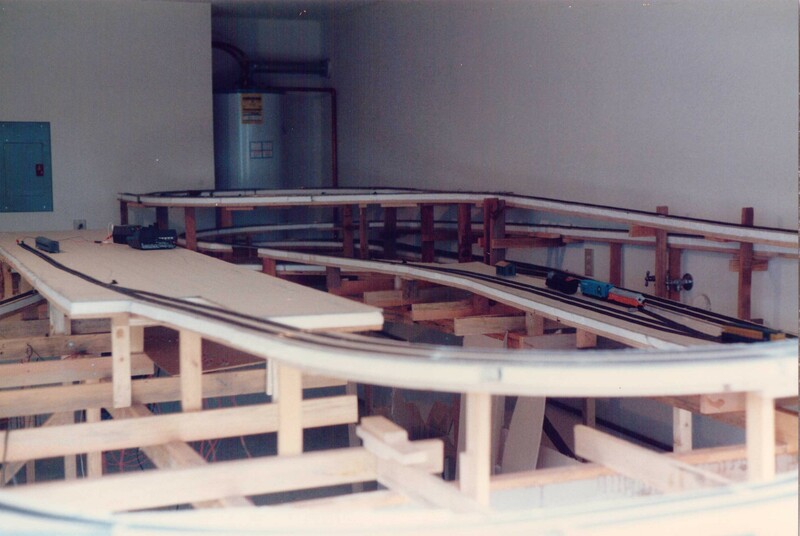 The base roadbed was 1/2" plywood, there was a subroadbed of 3/4" bedboard styrofoam glued to that (I think as an attempt to muffle the rumble of trains on the track), with the 1/4" upson board (a pressed paper product) roadbed glued on top of that. Finally came the track - Atlas code 100 flextrack. This track plan is the first to incorporate the basic operating concept which I still design around today - hidden staging which represents a major Class I road (in my case a transcontinental - the Great Northern) that ties into the modeled portion of the layout at a junction. Staging incorporates a long yard in the hidden trackage. Using this concept allows the operation of long trains occasionally, without having to accommodate them in overly-long sidings on the modeled parts of the layout. The large staging trains stop at the junction to pick up and drop off cuts of cars which the shorter trains on the modeled parts of the layout distribute to local industries or carry on through trains through the division point yard and back to staging. These staging trains can accept and deliver any car type in any quantity, as they represent everywhere in the world except the modeled parts of the layout. This provides very flexible operations at almost any tempo desired. This somewhat later shot is just before the layout was dismantled when I returned to Florida. Maybe you noticed that the water heaters in the backgrounds of the two pictures are different. I built this layout to be broken into several different sections in case I had to move it, and as it turned out I did move it across town. I broke it into sections and it rode, one section at a time, in the bed of my brother's Ford pick-up. It would have been very costly to have it moved across country, so when I returned to Florida (very briefly, as it turned out) I scrapped the layout. That was to become an all-to-familiar theme. During the next couple of years my modeling was on hiatus as personal circumstances changed radically. Suffice it to say that at the end of that span I was in Seattle, was now married (I thought. Turns out I wasn't, but that's a whole 'nuther story), and was in a small three-bedroom house with a two car garage that I immediately claimed for a train room. So I basically rebuilt the layout that I had dismantled in California. I liked the operating concept (I must, since I keep going back to it), the size of the space was nearly identical to what I had in Lompoc, so why develop an all-new track plan? A few tweaks to the old one and I was ready to go! Remember that brass H-6 I mentioned way up near the top of this page? I obtained it while in Washington. It taught me a lot, including that brass steam locomotives are much more sensitive to trackwork irregularities than are their plastic diesel cousins. I had constant derailment problems during The Deep Past, so when I began building layouts again in California, I paid a LOT of attention to trackwork and the rolling qualities of my equipment. As a result I had very few derailments. My trackwork was pretty darn good, but that steamer required an entirely new level of quality. My minimum radius was 24" on the layout, and that was the bleeding edge minimum for the Pacific. Several places on the mainline I had to remove and relay the track to smooth out small variations in the radius that took it just below 24 inches in places. I also had to focus more closely on track kinks - what the six axle diesels handled with effortless ease tripped the steamer and threw its drivers off the rails. Over about 50 hours of layout time, I was able to upgrade my track to the point that the steamer stayed on the rails as well as the rest of my equipment did. It was well worth the effort. To this day my trackwork is essentially bullet-proof. Derailments are all but extinct. When I have access to those additional photos to post that I mentioned earlier, I'll carry on with the story in Washington. Until then, let's move on. I left the State of Washington in December 1992. For the next four years or so my model railroading was once again in hiatus, as I was moving around the country from job to job, finally settling in New Jersey into a small apartment sometime in 1994. After a couple of years there I purchased a house in the charming little town of Wenonah, NJ, where the first of the full-blown CB&Q in Wyoming layouts was born. NOTE: All contents of this web site copyright Mark Pruitt, 2001-2017, except those items copyrighted by their owners. All rights reserved.